Well, I’ve finally been dragged into the Pinterest milieu. Last week I posted my first “board”: Best Web Services for Bands and Musicians. I give the rundown on each of the web-based services I would recommend to musicians, and provide pricing info as well. Please check it out and comment if you’ve used any of these services. Cataloguing the best online services for bands has been something of a pastime for me since my early, pre-2000 days of digital music blogging, so it’s nice to return with something much more publicly visible. 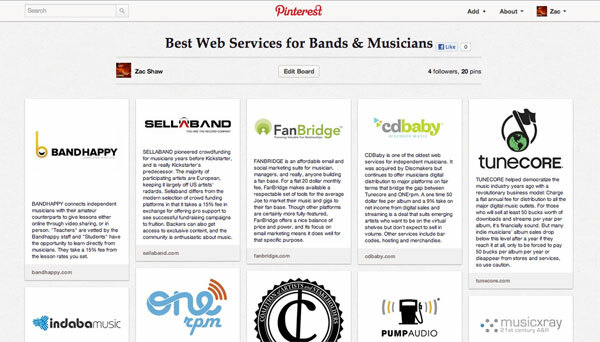 Certainly, the list of worthwhile web services for bands has grown quite a bit. There are over 20 great services on my board, and more I’ve probably yet to discover or are about to launch. So, which of these services should you enlist with? It depends on where you are in your musical career, but even professional musicians will find something that can boost their revenue. In terms of budget, there’s something for everyone — these services range from free with a standard 10-20% revenue share to flat subscription and submission fees. Ultimately, my advice is to take it one service at a time and build slowly and strategically, out from the core of a strong band website. As always, none of this will matter if your music is no good, so don’t squander your hard-earned money until you’re confident in your songwriting and production skills. Band Website: It’s hard to beat Bandcamp for setting up a band website with your music, and allowing fans to buy it directly from you. Other honorable mentions include BandPage, Bandzoogle and CDBaby. CASH Music is an exciting new open-source band website project that should pique the interest of developers. For less development-inclined but somewhat tech-savvy website construction TopSpin is leading the industry with a suite of widgets for band websites and social pages that accomplish pretty much anything you’d want a band website to do, with a focus on generating revenue. 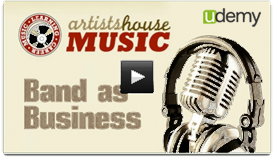 Band Marketing: There are a number of great marketing avenues for bands. MusicHype is a great way to identify and engage your top fans. FanBridge is an easy-to-use email and social marketing platform purpose-built for bands. These specialized tools are simple compared to ReverbNation, which basically does anything you could think of in terms of band marketing. Band Booking: SonicBids has been around forever and is still very useful for the right band to land the right gig. Indaba Music is a newcomer that helps match bands with music industry opportunities, including shows. Crowd Funding: Sellaband predates Kickstarter as a powerful fundraising platform for musicians primarily based in Europe looking to support large production and marketing efforts. Pledge Music is a fairly new crowd funding platform that deserves attention for being purpose-built for musicians. Digital Distribution: There are a number of solutions here, and which is right for you depends on your projected sales. CDBaby.com is best for musicians who expect to sell a low volume over a long period of time, as their one-time fee of $50 for album setup and low 9% royalty rate. For those who want to target specific digital distributors, ONErpm features low submission fees and no annual recurring cost. Finally, if you expect to net at least $100 in revenue from album sales, you might want to check out TuneCore, which takes 0% of your revenue but charges a recurring $50 per year fee whether you’re selling or not. Music Licensing / A&R: MusicXRay, SoundOut, Taxi.com and Pump Audio are great low-risk options to get your music licensed. Which one works best for you ultimately depends on the type of music you play, and your expectations for licensing fees and opportunities. Music Lessons: Independent musicians teaching amateur musicians is a growing revenue stream, and Bandhappy helps connect teachers with students to make lessons happen across web video connections or even in person. Great list! We just opened another one: Audiokite Research helps independent musicians and labels gain insight into their song’s public perception and commercial potential by leveraging Amazon Mechanical Turk’s crowdsourcing technology.